This project was completed in February 2010 and uploaded to LastFM. It was subsequently discovered to have been removed, apparently as part of a policy change by LastFM, and was therefore uploaded to this server 11 May 2017. This was a very sharp stylistic break with the previous CD. For a start, vocals vanish entirely (apart from voices recorded purely incidentally). I can't altogether rule out the possibility that Oona and I may feature faintly somewhere, though I haven't noticed if we do. 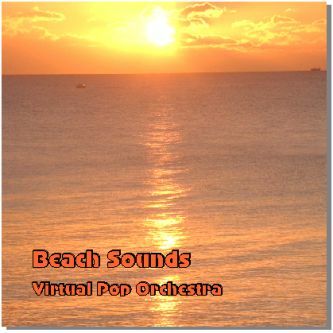 Secondly, and oddly for a music CD, the music isn't actually the main focus - the aim is to conjure the atmosphere and ambience of the seaside, and the music where it occurs is purely to that end. Quite a lot of it, around a third, consists only of location recordings with no orchestration at all. Thirdly, very consciously and deliberately, the orchestration was written in what you might call a pseudo-classical style, using much more sequential structure rather than cyclic, and with longer loops where repetition is used. I had been listening to classical composers, particularly Beethoven, and noting that although they used repetition it was done very differently from standard pop music repetition. I wanted what I wrote to be richer, fuller, more sophisticated, with more depth, more about it, more to listen to. Fourthly and on a lighter note, this was the first CD I ever made that did not have a reference to death on the cover somewhere (which had become something of a trademark). Finally, this was a project that happened almost by accident. I recorded the location sounds with an idea I might compile them into a CD purely of seaside recordings. When I studied what I had, there were a lot of mono recordings and I increasingly felt I needed to add orchestration to what I had, and set to creating what became an integrated whole that sounds all of one piece, like jigsaw pieces fitting together. There is I think no doubt that this is a vastly better written (and perceptibly better produced) project than anything that went before it, and I finally succeeded in conclusively bettering Mustn't grumble, which had been a high water mark until I completed Beach sounds. I expect to have a small number of CDs of this project available shortly if anyone who knows me cares to ask for one. This album has been uploaded to LastFM. You should be able to listen to the tracks there. 1. Peaceful surf & people - nearly ten minutes long, two guitars plus effects, plus (as with all these tracks) on location sound recordings. Nothing else, just these elements. I could have very easily added strings and other instruments, it would have sounded great, but I didn't do it. I thought, Beethoven could have written something really good without resorting to that, let's have a go. You could say there was a certain bloody-minded obstinacy about it. I remember doing a lot of work on effects and note lengths. I found out the hard way that letting Music Creator normalise the sound levels isn't always a good idea as it would appear it sometimes costs sound quality. I also remember umming and erring over whether to put the faster section in, but the idea was that the CD would become more relaxed and chilled out as it went on. If you don't like the waves, adjust the balance towards the right or turn the left speaker down. 2. People seagulls - like a lot of the rest of this CD, I was playing around with DASample's Glaceverb plugin, as I suppose I had been doing for much of the last couple of years. I wanted a sort of ethereal effect, with the notes floating and shimmering rather than sounding as such, all sort of swirling around like the sea. I had in mind somebody only half listening to this as they were nodding off. The whole CD was intended to drift through the awareness reallty, rather than be concentrated on intently. 3. Waves, gulls & people I - this is a composite location sound recording. It doesn't contain any orchestration. It's about seven minutes long. There's a fair amount of wind and some motor bikes which were quite a long way away as I remember it. People were wandering past, sometimes talking to each other, which wasn't intentional, it just happened. Around a minute or so in a man and a woman happen along and odd snatches of what they say get caught by the microphone on the right speaker, possibly depending on whether they were facing towards the microphone or away and on which way the wind was gusting at the time. It almosts sounds as if he is saying Karen doesn't have any water, but a few moments later he says, "We don't need to be in a hurry to deal with it either," and she says emphatically, "No." There is some maniacal laughter on the left speaker, and later some seagulls. There are a lot of vehicles on the right speaker, which must mean I was recording it near a road. Towards the end two or three children turn up, one calling for its mother. There is a child moaning, and one saying loudly, "Doobydoobydoobydo". The track fades out shortly after this. 4. Small waves faint people. This is highly experimental, and a lot of time and trouble went into it. This track especially contains engineered instrumental sounds of an ambient type rather than conventional music as such. I did have some concern about this one as initially it sounded too jerky. I added a sitar, but then it sounded too shrieky. I tried modifying the effects, but it still sounded like the sort of thing that would give someone a headache. Realising that the sitar must be wrong, I tried different instruments and effects, finally settling on an oboe with equalisation set to emphasise the treble range. I spent a little while adjusting the oboe to make the variations in the sound from it as interesting as possible. 5. Waves motor boats. The flute was an addition during editing. Actually it did sound fine without the flute, but I've always tried to make the sounds as rich as possible and if in doubt have usually added something rather than not. Again the waves are mixed quite loud on the left speaker, because the idea was that the music isn't supposed to be the focus, it's just there in an ethereal sort of way, kind of drifting around on the wind. There is also a fair amount of deep strings mixed quite loud as I often find deep resonant strings quite appealing. The orchestration stops slightly oddly and the track fades out quickly after that. 6. Waves splashing steadily. Though I say it myself, this is a masterpiece. I was looking for different kinds of sounds, I didn't want it all to be strings, piano etc. I know the first part sounds like an organ but it's actually pan pipes with heavy effects. I just struck oil with this, it sounded fantastic. Part way through, a nylon guitar gently changes the mood. The pan pipes come back in to accompany it. Near the end, the guitar takes up the theme that the pan pipes started with, and it still sounds just as good. A gentle guitar strum finishes it... gorgeous. When I was editing, I started to listen to this, but then I thought, I can't change it, it would be sacrilege, so I left it as it was. 7. Waves gulls & people II. This is another composite location sound recording that does not contain orchestration. It's about six and a half minutes long. I seem to recall putting fairly heavy effects on the waves on the right speaker to get them to sound right. This is a fairly rowdy track with a lot of indistrinct shouting going on from the left speaker. Some of it sounds foreign. Again, the left channel seems to have been recorded near a road. There was no particular connection I was aware of with Waves gulls & people I - the titles came from phrases I used while going through the original location sound recordings to describe what was on them. When it was time to pick track titles, I thought, let's just use those, so they stuck. 8. People wind quiet seashore. This has tinkling piano notes, sparkling like reflections on the water, while the trumpets shrill like the noonday sun and a darker sparkle is added by a sitar. Strings purr subtly. At around two and a half minutes the piano starts twinkling very prettily. The sitar rounds it off nicely. 9. Waves street people & gulls. Composite location sound recording, does not contain orchestration. This time the waves are quieter and softer from the right. There is a lot of chattering from the left. Some of it sounds French, and it is possible that part of this was recorded in France. 10. Peaceful waves. An echoey guitar starts this off to be joined by gently shimmering strings and a subtle piano. None of it is earth shattering or attention grabbing, just gently soothing. Part way through there is a pause until the strings come lazily back in. Around five minutes in some large boots come crunching past; that is, the left speaker must have been recorded near the water on a shingle beach. The guitar gently rounds things off shortly afterwards. 11. Waves thundering. Composite location sound recording, does not contain orchestration. There is some clicking or creaking at times on the right speaker of this one, together with some indistinct chattering. I am not sure what this clicking/creaking was, although it's possible that it was a fishing line or a chair creaking. There are some loud waves on the left speaker, and again I think these may have had significant effects added to them. After a time a dog starts barking. I think part of this was recorded in a seafront cafe. The speakers fade out one after the other. 12. Waves on shingle. At the risk of being immodest, this is another masterpiece that I was very proud of when I had finished writing it. There is a very aquatic sound to it, reminiscent for some reason of an acquarium. Especially in the second half I wrote it intuitively, going where I felt it wanted to go rather than piecing it together logically. At times you can feel it following a train of thought, following it's nose almost. The waves can be heard pulling strongly on the shingle, and the stones bounce over each other as they tumble back towards the sea. From around half way through, above the sound of the waves, a bell on a buoy (orchestrated of course) can be heard tolling sporadically as the waves sway it to and fro.The strings stop just after four minutes, and the bell is left to itself, before the orchestration gently comes back in again. The ending is really glorious.